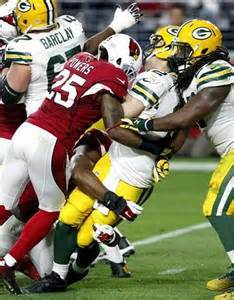 Here are several stats you may not know from the Packers 38-8 loss to the Arizona Cardinals on December 27 (the stats all reflect regular season games unless otherwise noted). Green Bay won three and lost one game to the NFC West this season. In the Mike McCarthy era, the team is 15-7 against the NFC West with five of those seven losses coming on the road. The Pack is 5-5 in their last 10 games against NFC West foes. The game was scoreless after the first quarter. It was the second scoreless game after one quarter for the Pack this season. Green Bay is 22-14 in games that are tied 0-0 after the first quarter since 2000 (10-12 on the road; 12-2 at home). Arizona scored first in the game. Since 2010, the Pack is 23-16 when the opponents score first, but only 7-12 in such games since 2013. The Packers QBs were sacked nine times in the game. They are 1-11 in games since 2000 when their QB is sacked five times or more in a game. Green Bay is 3-6 in games the last two years when Aaron Rodgers throws at least one interception in a game. Yesterday was the 10th time in Coach McCarthy’s tenure as head coach (since 2006) that the team was held without a point in the first half. They are 2-8 in those games. It was the fifth defeat of 30 points or more for the Packers since 2000. Arizona QB Carson Palmer had a 102.2 QBR. It was his second QBR over 100 against the Pack; he did it in October 2005 as a member of the Bengals in a 21-14 win. He had a 102.2 QBR in that game. It was the ninth game since 2006 that the Packers scored less than 10 points in a game. They are 2-7 in those games. Here’s an interesting stat for you… the Packers held the Cardinals scoreless in the first and last quarters of the game. Prior to yesterday’s loss they had won 29 straight games when they held the opposition scoreless in quarters one and four. Since 1966 (the Super Bowl era) the Pack is 102-24 (.810) in games when they keep their opponents off the scoreboard in the first and last quarters of a game. The Pack gave up two scores on fumbles returned for a TD. It was the third time this has happened to the Packers since 1966. The other games were in 1971 (versus the Giants) and 1984 (versus the Broncos). Green Bay gained an average of 2.8 yards per play in the game, the second lowest total in the last 10 seasons. The lowest was 2.5 yards per play in a Nov. 19, 2006 loss (35-0) to the Patriots. Clay Matthews did not have a tackle for the second consecutive game. He has had zero tackles in seven of the 100 regular season games he has played for the Pack. The Packers had 178 total yards to the Cardinals’ 381. It was the third time since 2006 that the Packers offense was held under 180 yards and the defense allowed 360 or more yards in a game. Since 1966 it has happened in 16 games, 14 of them were when the Packers were the road team. Yesterday’s 30-point loss is tied for the second worst defeat by the Packers in the McCarthy era. It’s also the fourth straight year that they have lost at least one game by 20 or more points in a season.